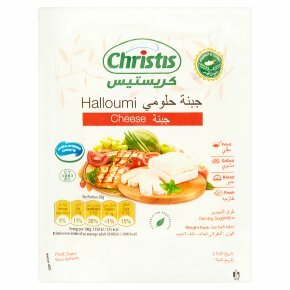 Halloumi Medium Fat Hard Cheese made with cows', ewes' and goats' milk. Remove all packaging. Cut into slices. Fry in a little oil for 2-3 minutes turning occasionally. Remove all packaging. Cut into slices. Place product under a pre-heated medium/high grill and cook for 2-3 minutes, turning occasionally. Cooking appliances vary. These instructions are given as a guide. Please ensure that the product is piping hot throughout before serving. Great grilled, skewered on kebabs or served with salad. To eat it like the Cypriots do, try serving it fried with chunks of fresh watermelon.Serve and enjoy. Remove all packaging. Cut into slices or cubes. Cook for 2-3 minutes. Turn frequently to give a chargrilled effect.